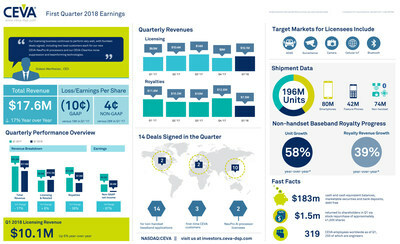 MOUNTAIN VIEW, Calif., May 9, 2018 /PRNewswire/ -- CEVA, Inc. (NASDAQ: CEVA), the leading licensor of signal processing platforms and artificial intelligence processors for smarter, connected devices, announced today its financial results for the first quarter ended March 31, 2018. Starting in fiscal year 2018, CEVA will report its earnings under the new revenue recognition standard, ASC 606. Total revenue for the first quarter of 2018 was $17.6 million, a 17% decrease compared to $21.3 million reported for the first quarter of 2017. First quarter 2018 licensing and related revenue was $10.1 million, an increase of 6% when compared to $9.5 million reported for the same quarter a year ago. Royalty revenue for the first quarter of 2018 was $7.5 million, a decrease of 36% when compared to $11.8 million reported for the first quarter of 2017. Under ASC 606, CEVA's royalty revenue represents actual or best estimates of customer shipments during the first quarter. Revenues for the first quarter of 2017 was reported under ASC 605, the old revenue recognition standard, where royalty revenue was reported one quarter in arrears. Under ASC 605, CEVA's first quarter 2018 royalty revenue was $10.0 million, a decrease of 15% year-over-year compared to $11.8 million reported for the first quarter of 2017. As required by the Financial Accounting Standards Board, throughout 2018, CEVA's quarterly financials will be provided under both revenue recognition standards to allow a more aligned year-over-year comparison. Gideon Wertheizer, CEO of CEVA, stated: "Our licensing business continues to perform very well, with fourteen deals signed, including two lead customers each for our new CEVA-NeuPro AI processors and our CEVA-ClearVox noise suppression and beamforming technologies. In our royalty business, the market experienced excess channel inventory in the low tier smartphone and feature phone markets, which resulted in weaker than expected baseband shipments in the first quarter. This was partially offset by continued growth in shipments and revenue from our non-handset baseband customers, increasing 58% and 39%, respectively, over first quarter 2017 actual shipments." Of the fourteen license agreements completed during the quarter, eight were for CEVA DSP and AI products, and six were for CEVA connectivity IPs. All of the licensing agreements signed during the quarter were for non-handset baseband applications and three were with first-time customers of CEVA. Customers' target markets for the licenses include smart cameras and vehicle-to-vehicle communications for ADAS, surveillance cameras, cellular IoT, Bluetooth headsets, car infotainment systems and advanced consumer cameras. Geographically, four of the deals signed were in China, two were in the U.S., two were in Europe and six were in the APAC region, including Japan. GAAP net loss for the first quarter of 2018 was $2.2 million, as compared to a net gain of $4.1 million reported for the same period in 2017. GAAP diluted loss per share for the first quarter of 2018 was ($0.10), as compared to diluted earnings per share of $0.19 a year ago. Non-GAAP net income and diluted earnings per share for the first quarter of 2018 were $0.8 million and $0.04, respectively, down from the $6.3 million and $0.28 reported for the first quarter of 2017. Non-GAAP net income and diluted earnings per share for the first quarter of 2018 excluded: (a) equity-based compensation expense, net of taxes, of $2.6 million, and (b) the impact of the amortization of acquired intangibles of $0.4 million associated with the acquisition of RivieraWaves and an investment in NB-IoT technologies. Non-GAAP net income and diluted earnings per share for the first quarter of 2017 excluded: (a) equity-based compensation expense, net of taxes, of $1.8 million, and (b) the impact of the amortization of acquired intangibles of $0.3 million associated with the acquisition of RivieraWaves. Under ASC 605, total revenue was $19.5 million. GAAP net loss and diluted loss per share were ($0.5) million and ($0.02), respectively. Non-GAAP net income and diluted earnings per share for the first quarter of 2018 were $2.5 million and $0.11, respectively. Yaniv Arieli, Chief Financial Officer of CEVA, stated: "During the quarter, we invested in new cellular IoT technologies to strengthen our position and value-add to customers in this burgeoning market segment. Additionally, the company repurchased approximately $1.5 million of its common stock under our existing share repurchase program. At the end of the quarter, our cash balance, marketable securities and bank deposits totaled $183 million, with no debt." On May 9, 2018 CEVA management will conduct a conference call at 8:30 a.m. Eastern Time to discuss the operating performance for the quarter. The conference call will also be available live via webcast at the following link: https://www.webcaster4.com/Webcast/Page/984/25277. Please go to the web site at least fifteen minutes prior to the call to register, download and install any necessary audio software. For those who cannot access the live broadcast, a replay will be available by dialing 1-877-344-7529 or +1-412-317-0088 (access code: 10118895) from one hour after the end of the call until 9:00 a.m. (Eastern Time) on May 16, 2018. The replay will also be available at CEVA's web site www.ceva-dsp.com.